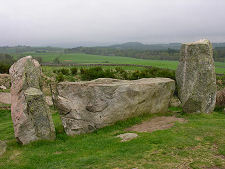 The Tomnaverie Stone Circle stands on a hilltop about three quarters of a mile south east of the village of Tarland in Aberdeenshire. 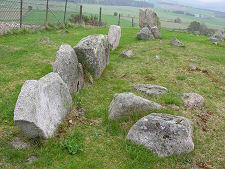 It is one of the 99 definite or probable "recumbent" stone circles identified in north east Scotland: so called because the largest stone was laid in a horizontal or recumbent position. 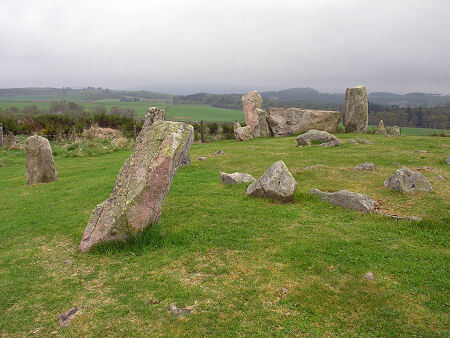 The stone circle was built here rather more than 4,000 years ago and the best theory available is that, like other such circles, it was intended to allow the farmers living in the area to plot the movement of the seasons. 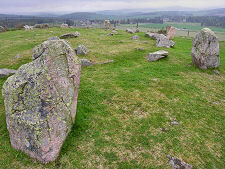 In this case, if you stand at the centre of the circle, the recumbent and its flankers - the large upright stones either side of it - frame the mountain of Lochnagar, and would have allowed different points of moonrise to be tracked. As originally constructed, the circle had a diameter of about 18m. 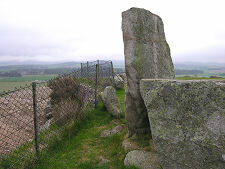 Unusually, the erection of the stones seems to have followed an earlier phase on the site, during which a number of kerbed cairns were erected containing the remains of cremations. Over time, the circle went out of use as an observatory, and it started to be used once more as a cremation cemetery. 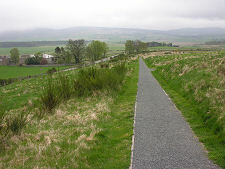 You approach the Tomnaverie Stone Circle up a well made path from a car park just to the south of the B9094. As you climb, you increasingly begin to appreciate the spectacular location chosen by our distant ancestors. As you get closer, you suddenly also begin to appreciate the lack of vision shown by our more recent predecessors. 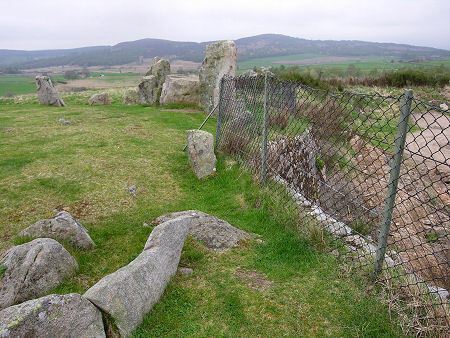 A fence which grazes the edge of the stone circle, and comes within a foot or so of one of the flanking stones of the recumbent, marks the edge of a quarry which has all but undermined the circle. The quarry operated in the early part of the 1900s and it was only the circle being taken into State care in 1920 that prevented it being totally destroyed. 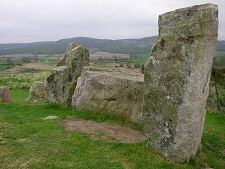 Some of the stones had already been removed, but were replaced in their original sockets during archaeological excavations in 1999 and 2000.